I hope you are enjoying your weekend. We are having a sunny day, and I am appreciating it immeasurable. Today, from Architectural Digest, comes a home that was totally redone, rather than bulldozed and rebuilt as another mansion…..unusual for the Hamptons, in this case Southhampton. 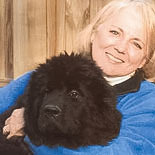 It is the home of J. Christopher Burch, ex of Tory Burch and father to their three sons. It is still large, at 6,000 or so square feet, sits on 2.75 acres, with 8 bedrooms, but small compared to the many imposing mansions of the area. The redo was done by New Jersey architectural designer Marina Lanina, who stripped it down to the bare walls, and reworked the interior spaces, and added a guest space above the attached garage. At the opposite end of the house she added a second floor master suite, but essentially stayed close to the original foot print. The kitchen was expanded at the rear of the house. He shares the weekend home with companion Monika Chiang, a fashion designer, and his young children. He also has three other children, all daughters, by a previous marriage, who are now adults. Burch is considered to have a quirky, somewhat eccentric taste, but steeped in classicism. It helps to explain some of the playful choices that New York interior design Christopher Maya made. Here us a brief glimpse into this home. The back of the home. Landscape designed by Joseph W. Tyree. I am a huge fan of white flowers only as a design choice. I wonder whether the hydrangeas are going to bloom white as well. Although a large home, it seems well grounded to its site. 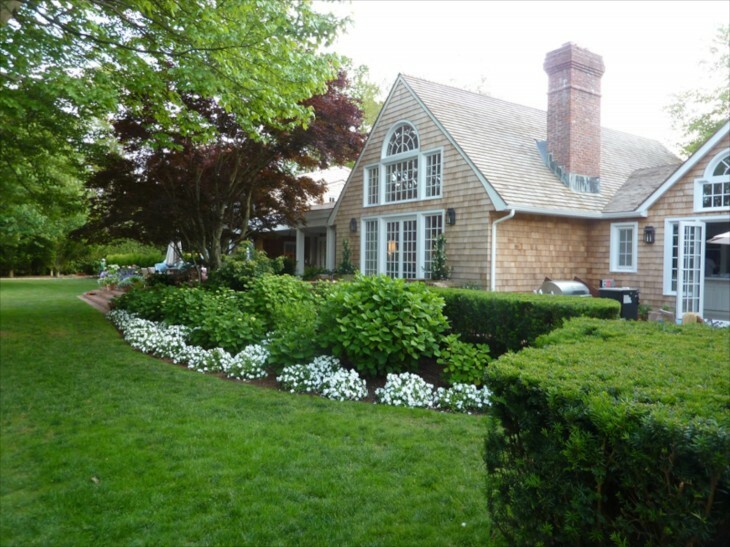 A sprawling ranch is a favored shingle style for me, and I really appreciate the architectural details on the exterior…..classic. 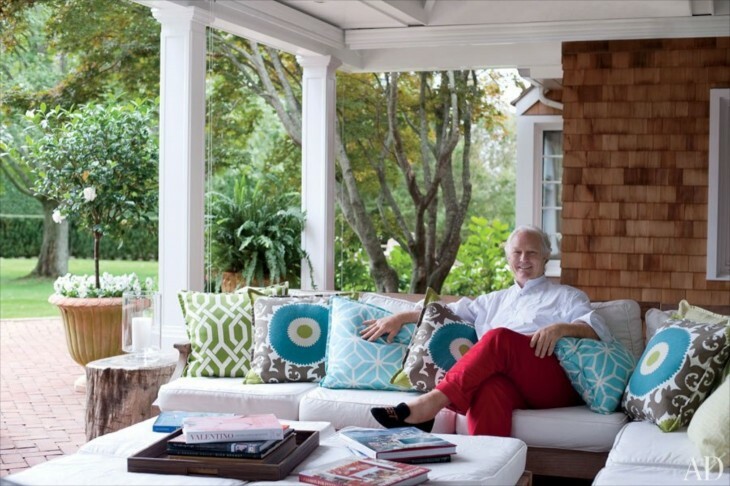 Owner J. Chrsitopher colorful and relaxed style is also seen throughout the photos of his home. The home was renovated by Marina Lanina Studio and decorated by Christopher Maya. I like the scale of this room. The cathedral ceiling is not overly high and the trussed and beadboard ceiling lends a sense of warmth to a large open great room. It is bright and there is a sense of playfulness with the choices of fabric and colors. The walls colors are all Benjamin Moore. The photographs hanging on the bookcase and over the mantel were taken by Len Prince. The dining table and chairs were designed by Maya, and the chairs feature Cowtan & Tow fabric. The rattan is vintage. 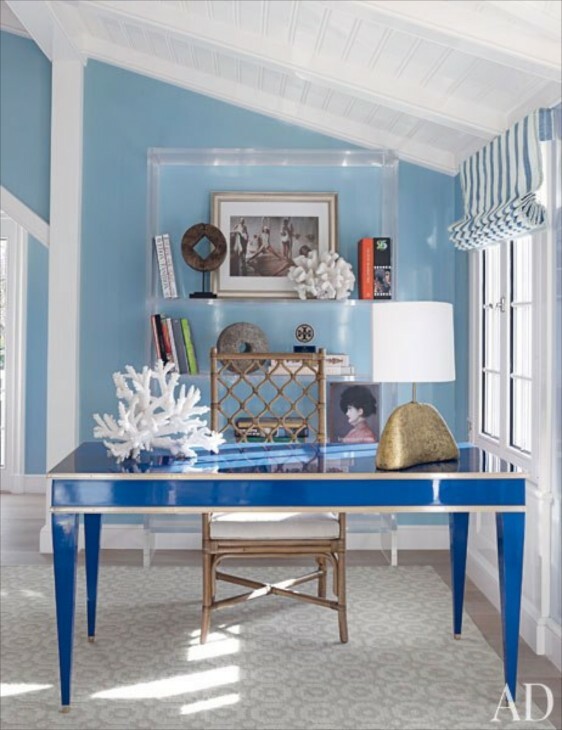 The gloss of the blue table offsets and balances a lot of texture, especially from the floor. The curtain fabric is by China Seas fabric, and the vintage rattan chair was found in Paris at a flea market. Photograph by Lockhart Collection. I like that the chair is wood, and also the texture and style of the chair, however, it must be a statement piece. for it can’t be too comfortable. I have sat in quite a few similar chairs, and they not only leave deep marks in your legs, but are simply not comfortable. For my design esthetic, statement pieces in furniture also have to be comfortable or functional, especially if I am designing for smaller homes, where every piece counts. This being a large home, it doesn’t matter I guess. I do like the total look though. The piece reminds me just a wee bit of the Bird’s Nest building from the Beijing Olympics. 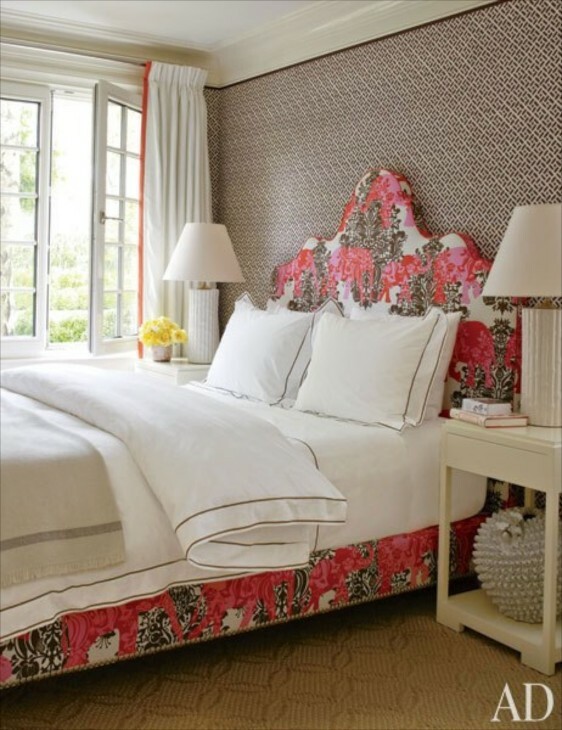 With a decidedly feminine edge, the room features a bed and TV cabinet designed by Maya. Notice that the wall and ceiling paint is high gloss. The bed cover reminds me of a Moroccan wedding blanket. This is also part of the master bedroom suite and features a desk based on a vintage Jansen model. 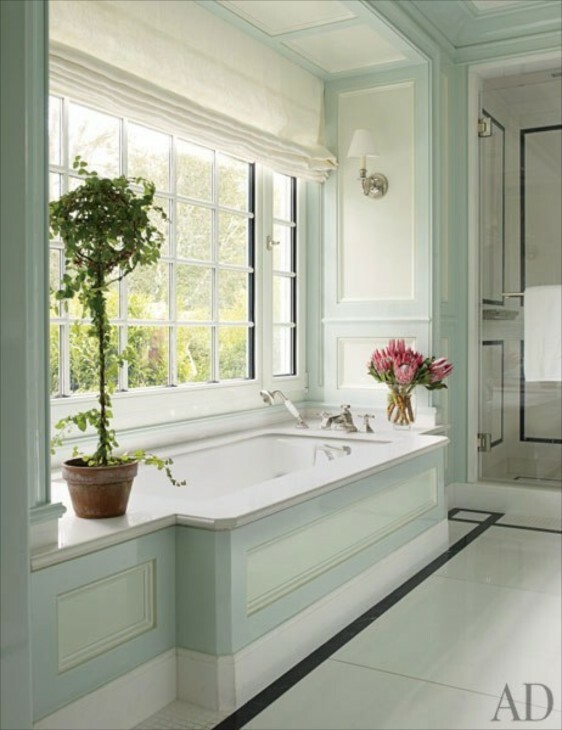 I rather like this master bathroom, serene and light. The tub is Kohler and the fixtures Kallista. The wallpaper is China Seas fabric. The headboard fabric from Country Swedish, bedding by Matouk. This is quite the exciting home. The color choices are so interesting, and gorgeous to me.Each room has some eye catching element to it. The bathroom greens are very spa-like. Love the green sitting room and the Country Swedish fabric in the bedroom, as well as the pops of pink in the blue and white bedroom. Lots of fun on this tour. Colorful indeed. I will probably do a followup post on this a month or so from now when I can find more interior photos. I would love to see the kitchen! I was surprised the garden’s were pretty subdued with no whimsy,at least it’s not visible.